Perth Amboy is a city about the size of Timaru back in old Aotearoa New Zealand. The city sits on a bay on the Raritan River and is about forty miles from the mystical Jersey Shore. Across the bay is Staten Island. John Bon Jovi was born here. Perth Amboy is kind of a broken down, rust-belt place with about four cops to each city block. As you get closer to the city council offices, you’ll come across five or six cops to each block. The local mayor was recently found guilty of corruption and is to be sentenced in January. It is obvious that someone or some force is trying to scrub these streets clean and that notion just becomes very difficult when there’s a high level of unemployment and manufacturing is now happening someplace else. This ‘someplace else’ where people use their hands to make something apart from fast food, is somewhere far over the rainbow. One of the nicknames of Perth Amboy is ‘Ambush City’ and in a lot of these places, the most alive thing in town is the interplay between the Police and the population. Of course there’s a lot of crime, there has to be. The town is like a digital tombstone from back in the Old West. The city centre looks like the OK Corral to me. But I’m never afraid of these things. That’s not what frightens me. 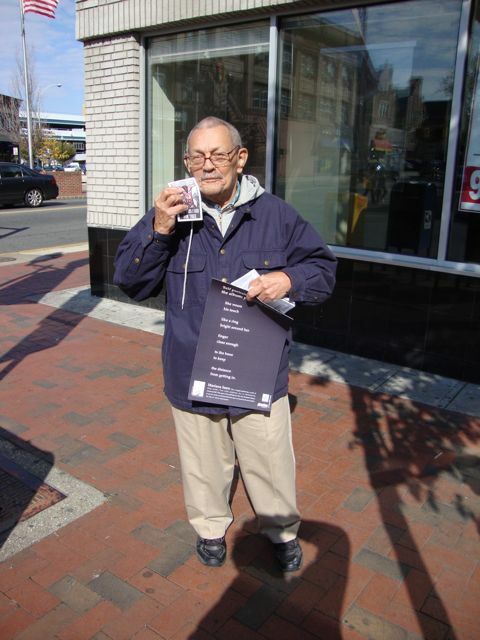 In Perth Amboy, I was carrying poetry posters by about six New Zealand poets and a couple of Americans. It is obvious that there once was some heavy-duty industry in Perth Amboy, but a lot of these areas collapsed decades ago and this city is now attempting to claw its way back. Yet there are numerous beauty salons because in life people have to paint something up and to put a face on. People try and make good of bad situations and the vast majority are not criminals. They live in hope and they wait. The population of Perth Amboy is more than 50% Hispanic, the majority coming from either Puerto Rico or the Dominican Republic. No Hispanic (legal or illegal) has ever insulted me in this country. They are not by nature an obnoxious people. So I felt perfectly safe in Perth Amboy, what frightens me most about America is what happens in the ‘better’ cities and suburbs. That’s where the deals are made. I just work one lamp-post at a time with my industrial stapler and I place my poetry posters for the best possible impact. I remember as I go what Renoir said about the purpose of art being to enliven the walls. Yes, and in a way, you can even look at all the rust and decay in Perth Amboy and think it to be a beautiful thing. I’m sure Nick Drake would have thought this way. The surrounding sadness is kind of exquisite and as you gaze about you still see people doing a pretty good job of holding their heads up high and living yet another day. So these are people you can easily like and I do. This city is just one more place where the notion of ‘hope’ never arrived in town on a freight train because there are none anymore. There’s very little heavy industry now and I’m sure there’s never enough food stamps. So what are you going to do? You can’t really bail a place like this out beyond a certain point because it has to find the bottom and then start again. These people are starting over each day and they kind of look proud to me. They will find a way out. That’s what people do. I have little faith in endless government programmes and I’m sorry about that. I’d rather people made something again. But, I put up posters. And I always sing as I go and I think about words and poetry. I see people smiling when they read the posters. That makes it for me. On this day, before I finished and went to Ray’s Hell Burgers, I was thinking about the Tom Waits song ‘Jersey Girl’ as sung by Bruce Springsteen. Because as you’re looking at all this stuff in America and at all the rust and decay, you need to have poetry and a firm rhythm in your head. You could get really angry, but everyone seems to do that and I’m not sure what difference it makes. I’m not sure anger really builds anything anymore; it just seems to be more of a fad to me. In America (or New Zealand) you can’t afford to have your thoughts and emotions thrown off track by either the news media or politicians. One woman, standing for Governor of California, is spending 140 million US dollars on her campaign. She obviously wants it real bad. That’s where heavy industry and all the action is these days, in politics. You just have to have a good profile picture and a few keywords. I remember they once asked Willie Sutton (famous bank robber) why he robbed banks, and his answer, which was priceless, was “that’s where the money is.” Politics is the new heavy industry and if the politicians were any good, then they’d actually be poets instead. So I’m sure, at the most basic level, it is words and music that get people by, whether in Timaru New Zealand or down by the Jersey Shore. Because people are subject to so much rubbish in spite of how clean the streets are kept. I think the lyrics to the Tom Wait’s song ‘Jersey Girl’ are a testament to hope in difficult times. The elections (for Congress and Senate) are to be held in America this week. I really don’t think much will change other than a different group of politicians will be doing all the talking. And in a couple of years, some other group of people will be calling for ‘change.’ It will go on because that’s where the money is. It’s heavy industry. At some stage, a bulldozer became an election sign. And I’ll take her on all the rides. When I’m walking down the street with you.